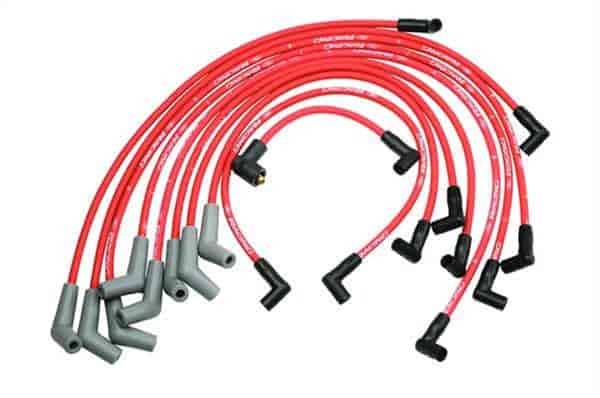 Ford Racing 9mm wire-wound high performance ignition wire sets feature a low resistance core combined with an incredibly effective shielding for minimum spark loss and long lasting performance. Silicone insulation and boots withstand high temperatures and voltage loss for minimum cross-fire and are highly resistant to fuels, oils and solvents. Long-life, tough stainless steel terminals for "post" type distributor caps. Includes coil wire for socket-type coil and "Ford Racing" identification. Cylinder number appears on each wire. Feature the same benefits of the Custom spark plug wires but can be cut to the length you need and crimp the ends in place. Includes terminals for post and socket type coils, plus easy to follow instructions. Wire sets M-12259-C301/R301/M301/Y301/C302/M302 do not fit distributorless ignition system (DIS) 5.0L/302 Explorer engines. The universal wire sets do not fit distributorless ignition system (DIS). Does Ford Performance M-12259-R301 fit your vehicle? M-12259-R301 is rated 5.0 out of 5 by 4. Rated 5 out of 5 by 88notch from great product for the money! wires already to correct size, no cutting or crimping needed. fit over Tall valcovers plenty of length on all wires. 9mm wire for 8mm price, cant beat the value and they look great also. Are these cut to your own length an crimp the ends or is it a pre cut set with the ends already attached? Thanks. Overview makes it seem cut your own, but reviews here an other places make it seem already pre cut with no custom ability?